Speakers are actually relatively simple devices. You should understand at least the basics of how speakers work before incorporating them into your home theater system. Basically, you have an enclosure (typically a box) into which speaker drivers are attached. The drivers are the round elements that many people call the speakers (they’re not). Speaker drivers look like cones or horns (or even ribbons or domes), and in fact, the large surface area of the drivers is called the cone or diaphragm. These surfaces move back and forth to make the sound. If you have ever pulled the front screen off your speakers or have seen speakers without their front grille on, you’ve seen speaker drivers au naturelle. 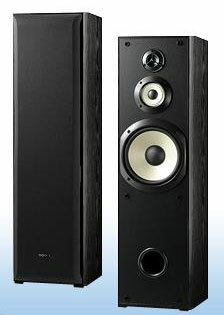 Tweeter driver: These handle the high-frequency treble range (above 2000 Hz). Midrange driver: These handle midrange frequencies (200 Hz to 2000 Hz). No single driver is well suited to handle all sounds from 20 Hz to 20,000 Hz; multiple drivers are commonly used to be able to span the full spectrum. Speakers that have multiple drivers in their speaker enclosure have electronic circuits known as crossovers, which divide up inbound speaker signals and distribute them to the appropriate driver. Speaker driver cones are typically made from paper, plastic, or metal. This material moves back and forth and creates changes in the air pressure (sound waves) that ultimately arrive at your eardrum and cause it to move back and forth in a corresponding fashion. This causes you to hear the sound. The cone is moved by an electromagnetic process that’s caused by a coil of wire, called the voice coil, at the base of the cone. The electrical impulses coming from the amplifier (or the amplifiers built into your receiver) drive the voice coil, and the voice coil interacts with a permanent magnet attached to the speaker’s cone or dome or whatever shape it may take.